The University of California Agriculture and Natural Resources created a call in January of 2014 for new UCCE Advisor and Specialist positions. The goal for filling these positions is to strengthen and rebuild the UC ANR network to meet programmatic gaps and emerging issues facing California identified in the Strategic Vision (see: ANR Strategic Vision 2025 full report or ANR Strategic Vision 2025 Executive Summary) and further refined in each of the 5 Strategic Initiatives entitled: Endemic and Invasive Pests and Diseases, Healthy Families and Communities, Sustainable Food Systems, Sustainable Natural Ecosystems and Water Quality, Quantity and Security. All 123 new proposed positions are listed on a public web page at this link. These proposed positions are presently undergoing internal review until August 18, 2014. The public is invited to comment on these proposed positions until July 21, 2014. Of the 123 positions proposed, 23 positions could benefit California's livestock, forestry and natural resources based industries. Those same 23 positions would have overlapping impact on both sustainable natural ecosystems, water quality, quantity security and sustainable food systems. I have listed in the table below those 23 positions with their identifying number, title, type of position (Advisor or Specialist) and where those positions would be located. Area Advisors are housed in one county but cover multiple counties. Specialists are statewide and support Advisor research and educational programs. If you click on the ID Number it will take you to the page where you can add comments for that position. There is also a link on that same page that describes the position in more detail. It is very possible that not all of these positions will survive the screening process. That's why it's important to have stakeholder input and I urge you to take the time to review at least each of these and comment. Please also comment on any of the other positions shown on the full list as well. It's also important to know that the comment process is not a voting one. Rather it is a supportive process from stakeholders who are visionary and statewide-thinking about the issues facing California's livestock and natural resources owners, managers and stewards. Some of these positions, especially the Advisors and a few of the Specialists, have had very successful people filling those slots. The public comments should not focus on replacing one of these great people but local, regional and statewide need for the position to work to solve current and future problems. As the statewide leader for the Sustainable Natural Ecosystems Initiative, I would also like to hear from my blog readers how you might rank the positions in the above table outside of the comments you provide on the public page links I've provided in the table. To do so just either comment on this blog article, message me via LinkedIn or Facebook or drop me an email at jmharper@ucanr.edu. Please put SNESI positions in the subject so I can search and sort. I look forward to hearing from you! Beef Industry Sustainability - Jude Capper, PhD. The attached pdf file below has registration and cost information. For questions contact: Abbie Nelson at (916) 804-4990. After almost two years, the Mendocino County Meat Plant (MCMP) Study is completed and the 92-page report is available for download as a pdf from either the UCCE Mendocino County web site (http://cemendocino.ucanr.edu/files/171140.pdf) or the Mendocino County Economic Development and Financing Corporation (EDFC) web site (http://www.edfc.org/wp-content/uploads/2013/08/MCMP-Final-Report-2013-08.pdf). The report was prepared under an Award from the U.S. Department of Commerce Economic Development Administration for the Mendocino County EDFC. The study authors were Shermain Hardesty, Cooperative Extension Specialist, UC Davis Department of Agricultural and Resource Economics and John Harper, UCCE Livestock & Natural Resources Advisor for Mendocino & Lake Counties. 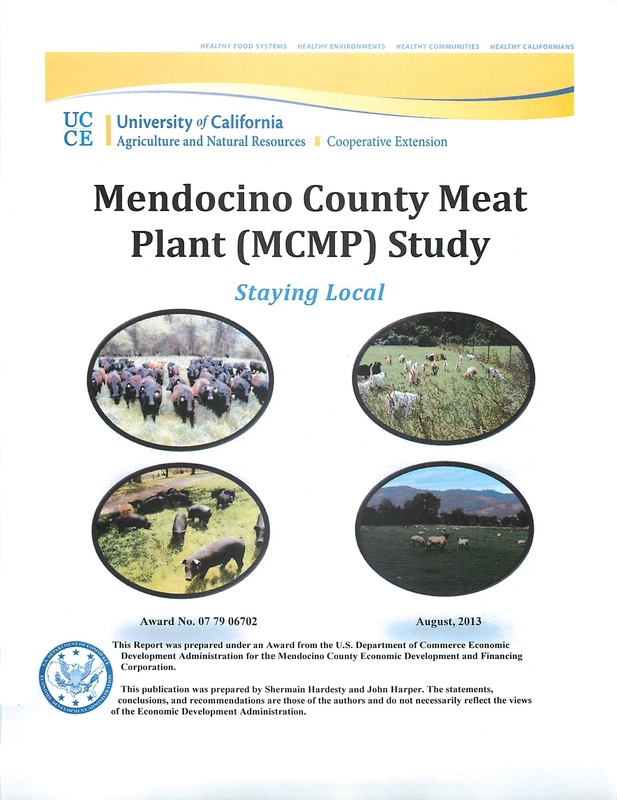 The study examined a proposed project for a small-scale multi-species USDA-inspected meat plant that would primarily serve ranchers in Mendocino and Lake Counties. The plant would handle cattle, hogs, sheep, goats and bison. It is different from most niche meat plants because most of the ranchers interested in using the facility already have established markets, primarily in the North and East Bay. Those ranchers would be shifting their harvest and/or processing from one or more existing facilities (none are located in Mendocino or Lake Counties) to the proposed meat plant. The study and report included an Analysis of Demand for USDA-Inspected Slaughter & Processing Services; Alternative Organizational Models; Alternative Sources of Financing; Plant Requirements, Options and Siting; and Financial Analysis of Three Options. The three plant options analyzed were: Option A - provides only cut-and-wrap services using a modular processing unit and a trailer office located in an industrial park with a total cost of $430,500; Option B - includes the same processing facility and trailer office described for Option A, plus a modular slaughter unit and adjacent holding pens located at a leased site on an unspecified ranch with a total cost of $821,100; and Option C - a built-in-place 2,400 square foot harvest and processing facility located on purchased property with a total cost of $1,425,516. All options have a capacity to handle 1,500 equivalent animal units (1 steer = 2 hogs = 2 lambs or goats) per year or 30 equivalent animal units per week. The plant would operate in a 50-week year with a single 8-hour per day shift. All three options proved to be financially viable. Option B has the highest Internal Rate of Return (IRR) of 11.1%. Option C's IRR is 6.6% and is impacted significantly by the purchase of 3.7 acres for $483,516. Option A's IRR is 3.9% but since it is cut-and-wrap only, it does not meet the needs of the ranchers doing direct marketing. Ten-year cash flow for Option C is included in the report. A public meeting will be held on September 5, 2013 at 5 pm in Ukiah to present the report and answer questions. The meeting will be held at the Sun House Public Meeting Room. The room is on the west side of the Grace Hudson Museum, located at 431 S. Main Street. Next steps include that authors Hardesty and Harper will prepare a business plan for implementing Option C for the EDFC. The following is a repost from the American Sheep Industry Weekly. Demand for locally sourced products in the United States has increased in recent years, but producers often claim that a lack of slaughter facilities is a key reason that it is not expanding more quickly, writes Chris Harris. According to a new report from the U.S. Department of Agriculture's Economic Research Service, although the share of total U.S. agricultural products sold through local food markets is small - direct-to-consumer sales accounted for 0.4 percent of total agricultural sales in 2007 - it continues to develop. According to the 2007 Census of Agriculture, direct-to-consumer marketing amounted to $1.2 billion in 2007, compared with $551 million in 1997, a growth of 118 percent, the report, Slaughter and Processing Options and Issues for Locally Sourced Meat by Rachel J. Johnson, Daniel L. Marti and Lauren Gwin said. The 2007 numbers are the most recent available from the Census of Agriculture, as the 2012 census is currently being carried out. The percentage of livestock operations selling product directly to consumers or retailers is much smaller than that for other agricultural products. In 2007, only 6.9 percent of livestock operations participated in direct sales, compared with 44.1 percent of all vegetable and melon farms. The report said that limited slaughter and processing capacity is often cited, particularly by producers, as a key barrier to marketing their meat and poultry locally. This report looks at the slaughter and processing capacity and options available to livestock producers selling into local markets. Read the report at www.ers.usda.gov/publications/ ldpm-livestock,-dairy,-and-poultry-outlook/ldpm216-01.aspx.